As builders go, termites do not have many tools at their disposal — just their bodies, soil, and saliva. For guidance they have nothing to go on save variations in wind speed and direction and fluctuations in temperature as the sun rises and sets. 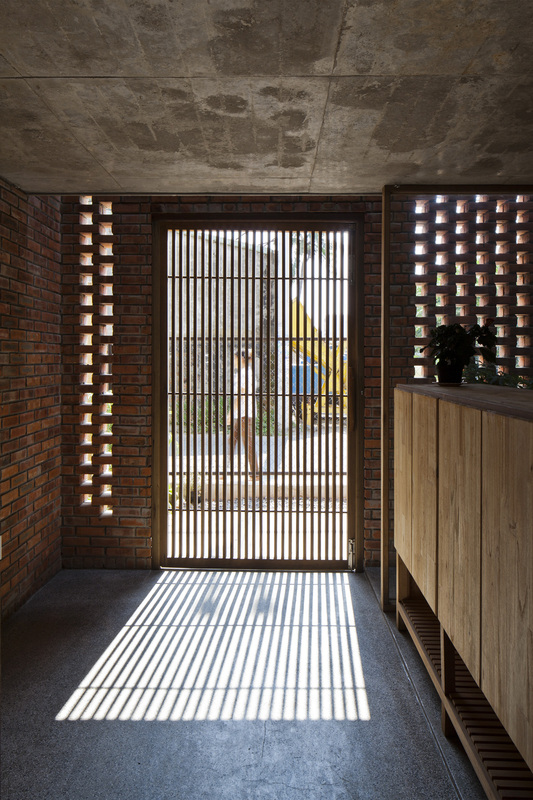 Similarly, the Termitary House was built in a tropical country in which the weather is extremely different between sunny season and rainy one. It is also influenced by a lot of tropical storms every year. 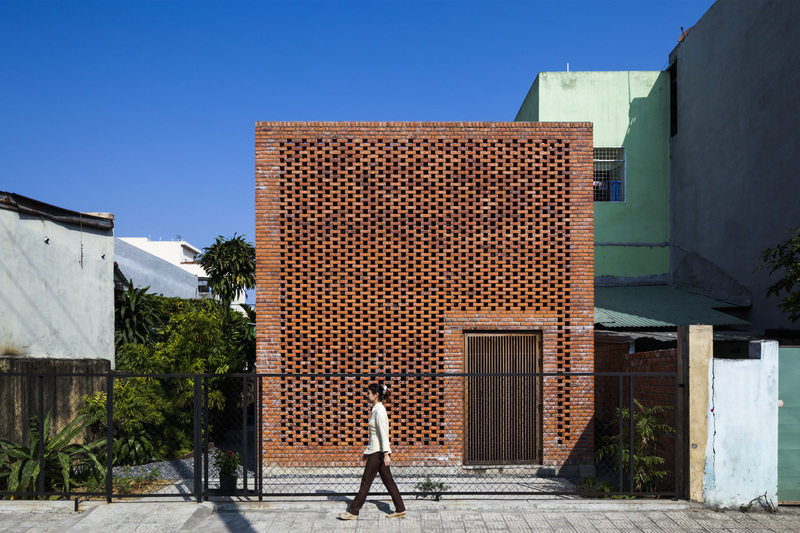 Structure of the house and solution for stormy season. 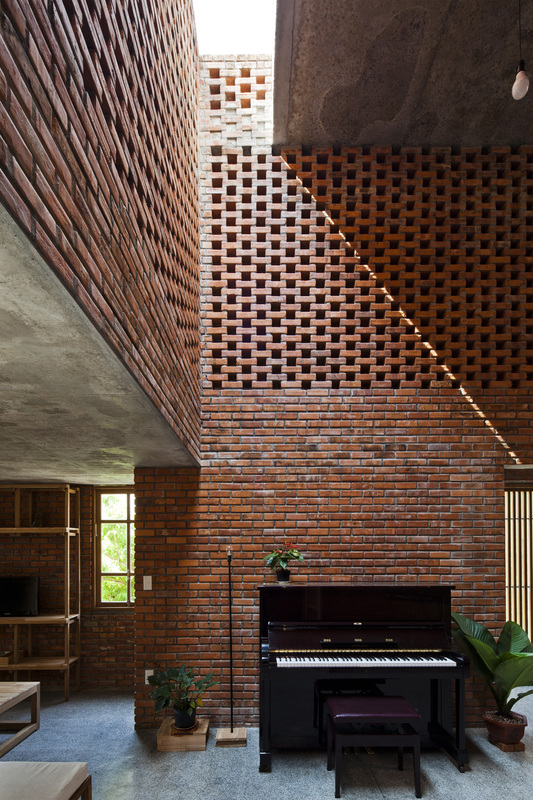 The structure of the house include many layers which are brick walls with holes arranged randomly like a termitary together with the large inter-floor space.Those holes are considered as vents help the wind rorate inside the house and allows breeze and light get to all corners in the house, created a refresh living environment. 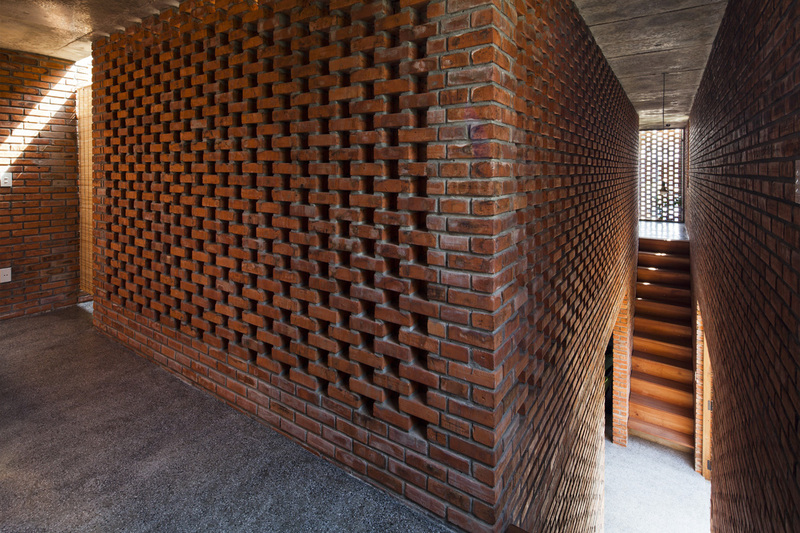 The special constructing technique of “double skins” with two layers : one brick wall covering outside and one slide – glass inside creates a space within a wall, which functions as a buffer layer at both gable. In stormy season, the second layer will help to block the strong wind and rain . Also, the buffer layer create a fluctuation in pressure, push the wind go straight toward to the gap. 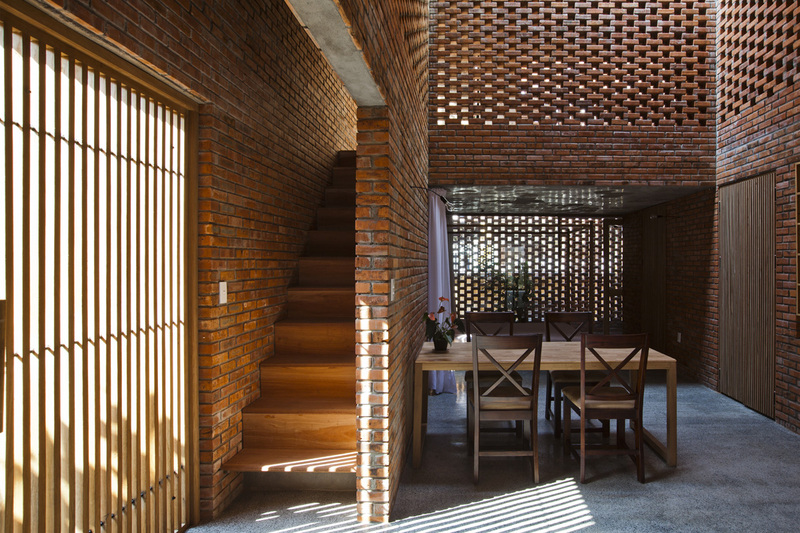 The architect allocated the stairs, warehouse and toilet in both East and West side created a buffer space to prevent the direct sunlight and make the structure of the house steadier in typhoons. 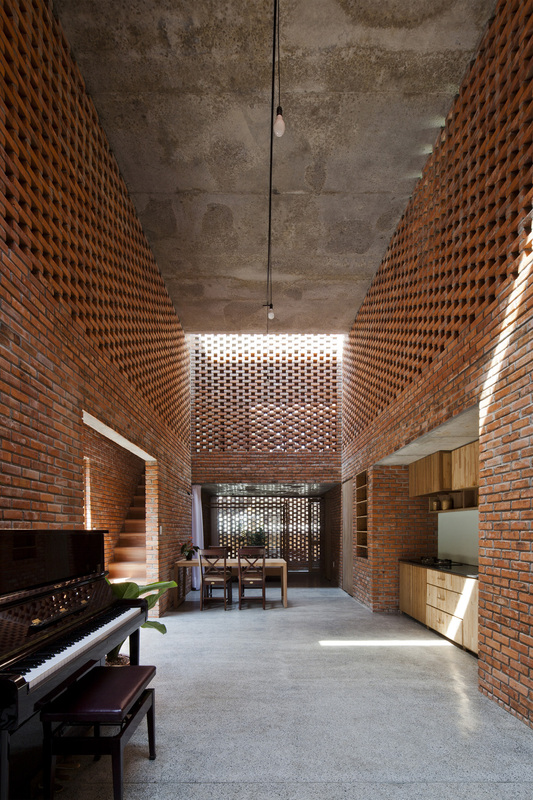 The house is with a large sharing space in the center where a cooking counter, a dining table, and an entertaining corner. 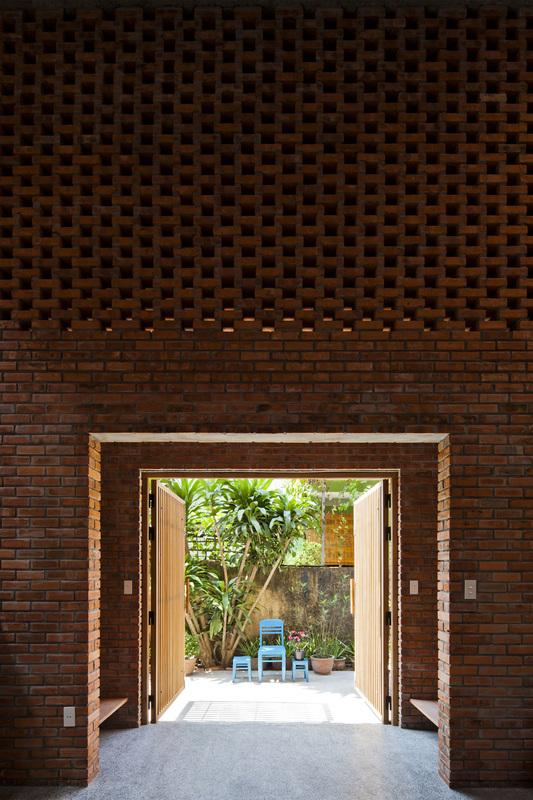 This “lobby” then leads to different functional areas in the house such as the rest room, the living room, and the bedrooms. 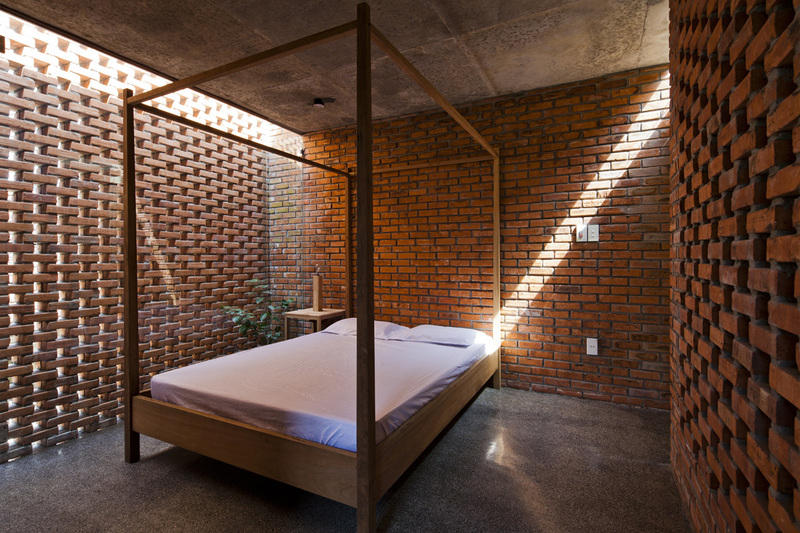 The mezzanine is where another bedroom, an altar room, and a small library are found. 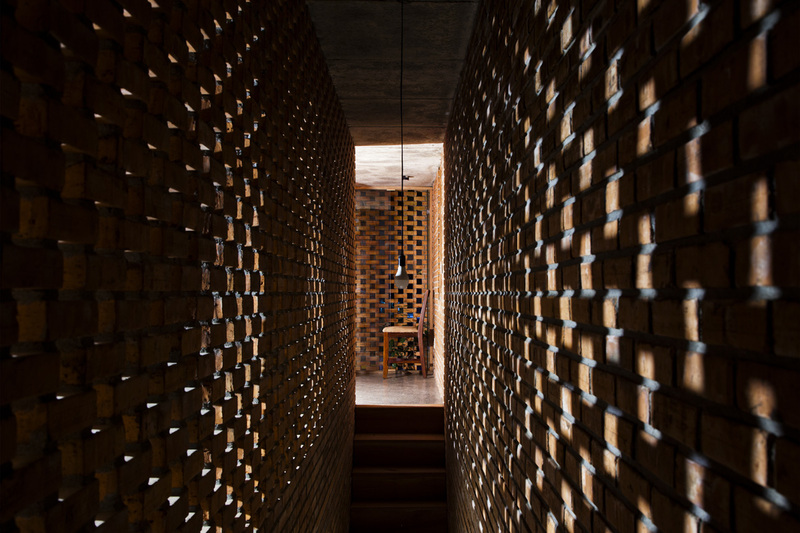 In the sharing areas in the house, the space is not limited by the wall, the family members can still see and chat to each other through the walls with holes. It can help to bring family member be closer in this morden busy life. 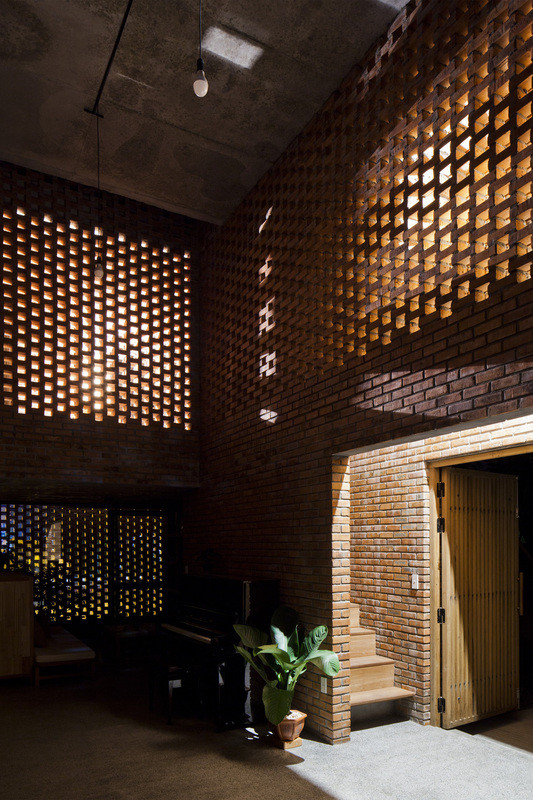 Lighting during the day, the natural light shines through to cast patterned shadows across the interior walls. 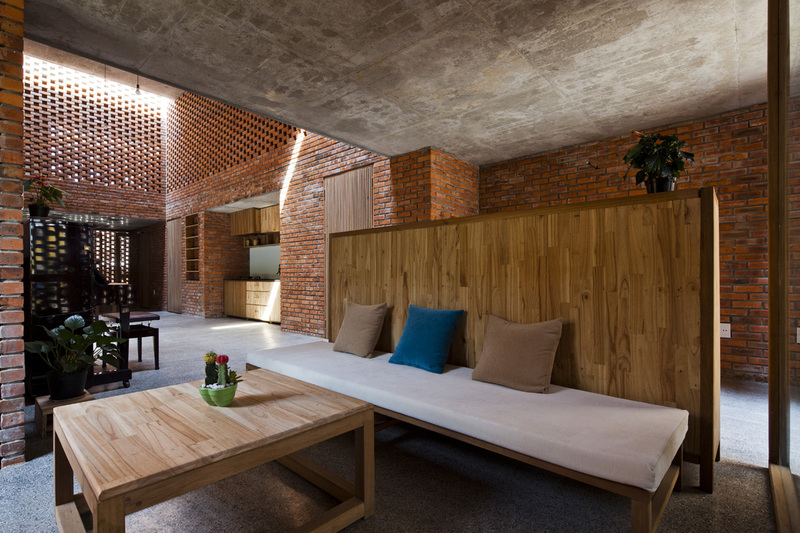 Slender skylights and relatively narrow offer light and ventilation, providing each room with a view of the sky and the lush green roof. They also serve as outlets for hot air to keep the indoor cooler. 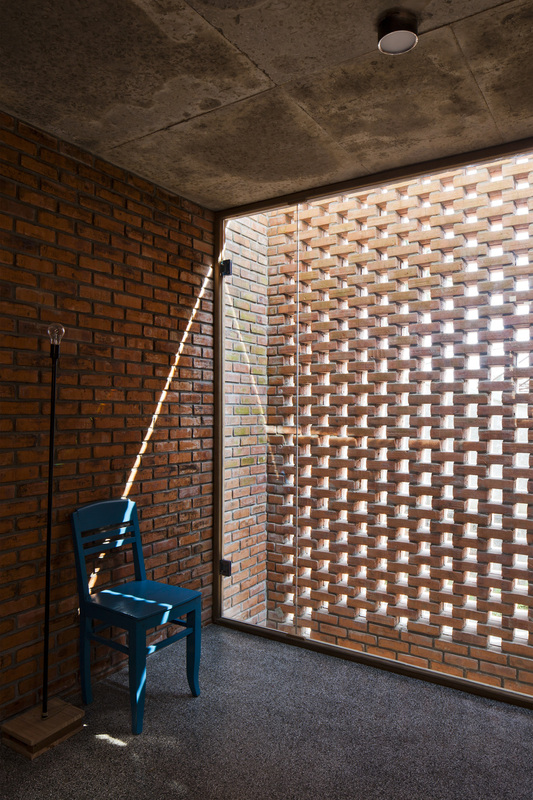 At different time during the day, the variety of the light intensity getting through the interfloor holes makes the brick wall colours change and creates variety emotion of colour on the surface of the brick. 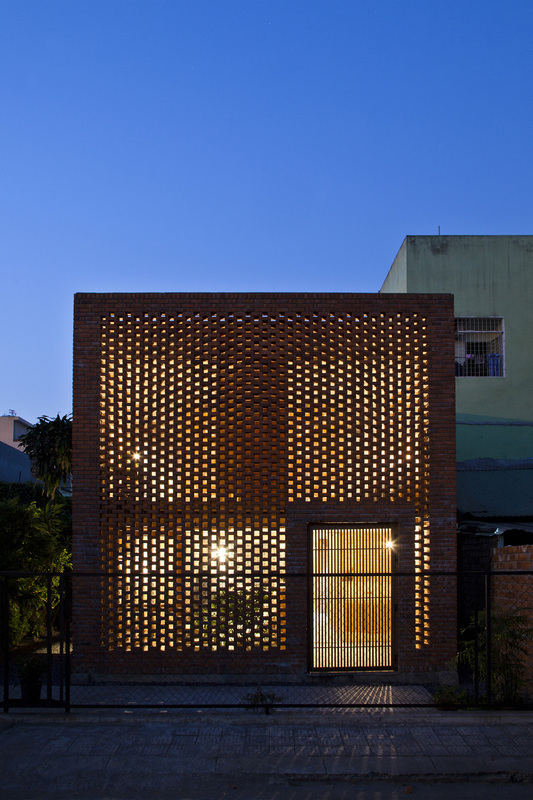 In the evening, the house looks like a giant lantern with light shining through the holes. The total cost is 27,000USD for 140 m square include 22,000 USD for construction cost and 5,000 USD for interior decoration, M&E and furniture. 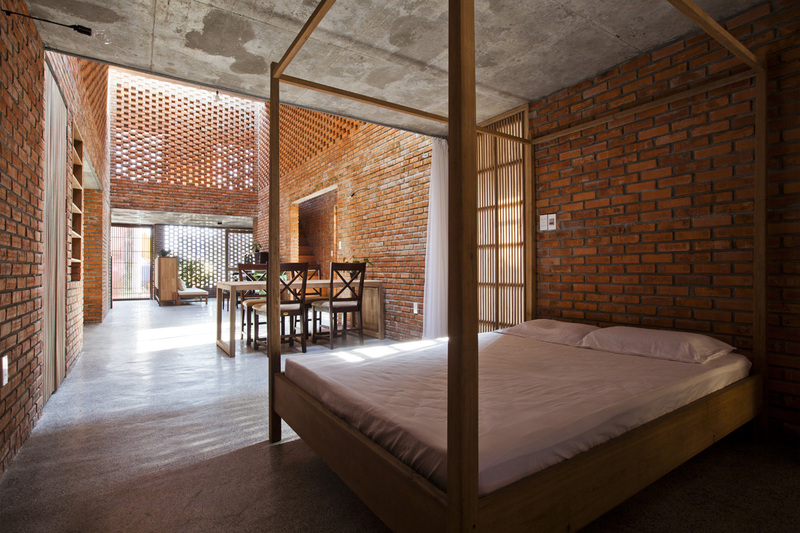 To save cost, the timber from old house is used to make furniture and apply very simple design for them. 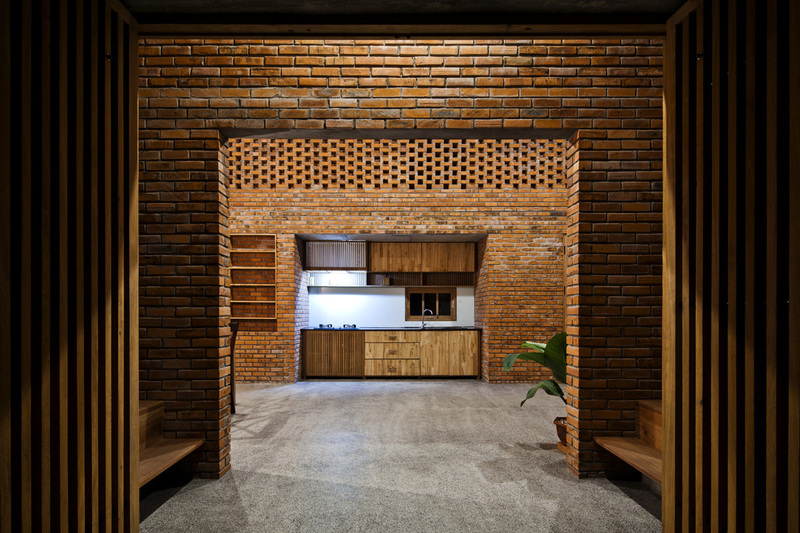 The architects also minimized the unnecessary thing for the house, starting by removing finish layer, and then reducing unnecessay walls and doors in the house. M&E (Mechanical & Electrical) is calculated carefully and used reasonablely to save cost as well. 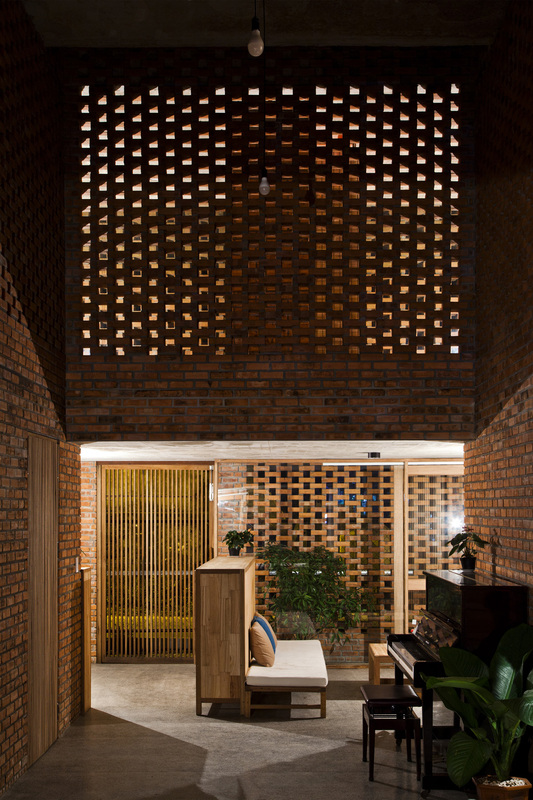 The most important thing is that before making decision to put some thing to the design, the team always questioned themselves if they eleminate them out, it will influence the function of the space or not. 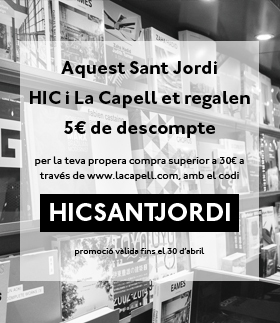 So that, they can have the right decision for the house and save the cost. 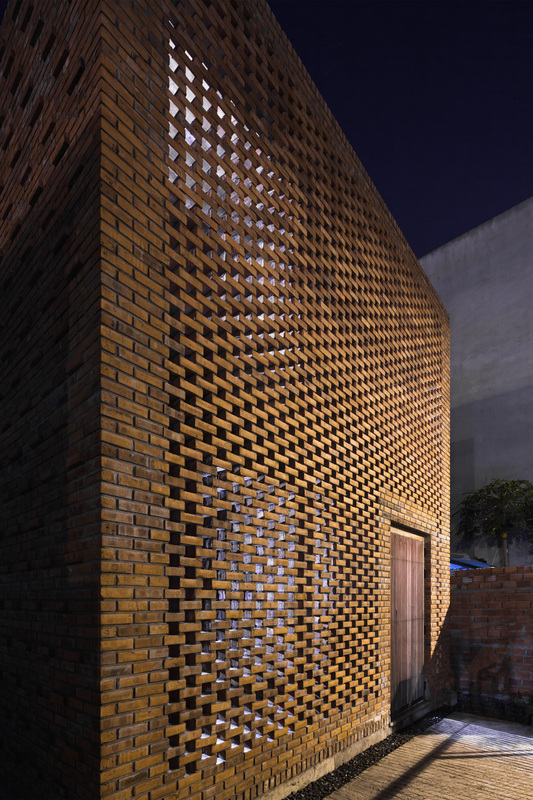 The tight bugdet is challenge for the design team, but it also helped to recognize that to make good buildings, you don’t have to make expensive buildings. 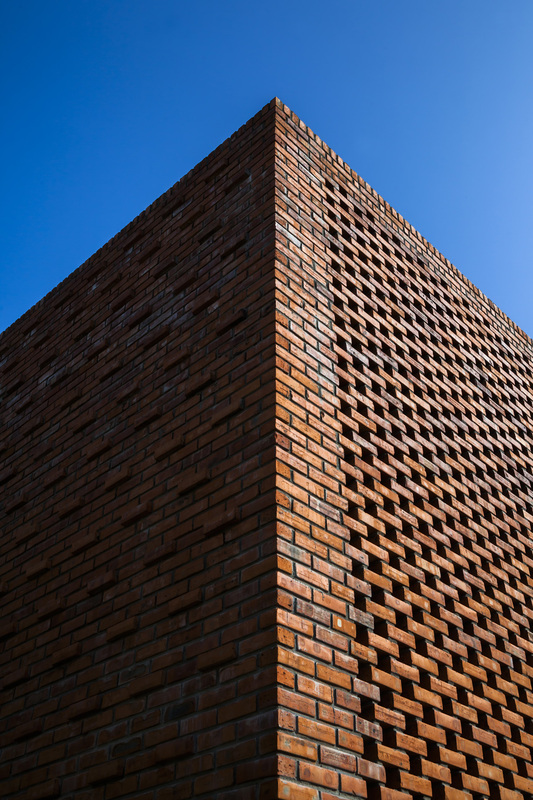 The baked-brick is a popular local material which reminds people about myterious temples in the local which was built by bricks for hundreds years ago. 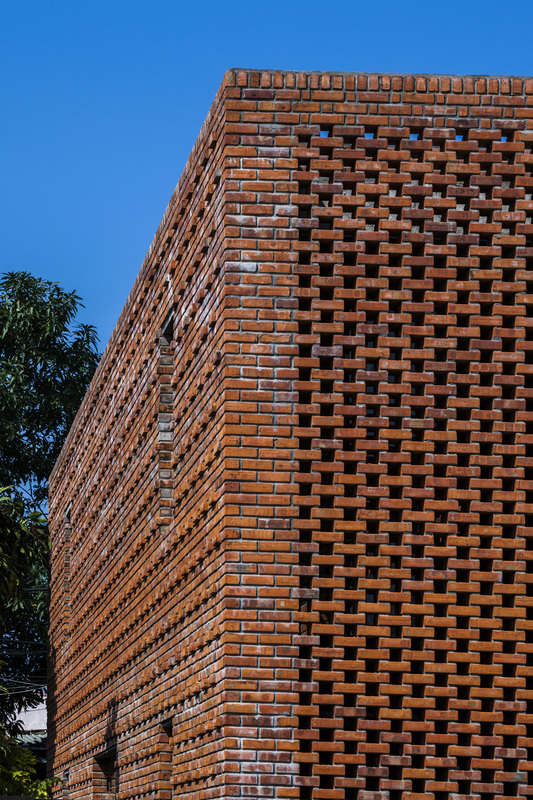 Under the tropical sunlight, the color of the brick changing, bring different feelings at different time. 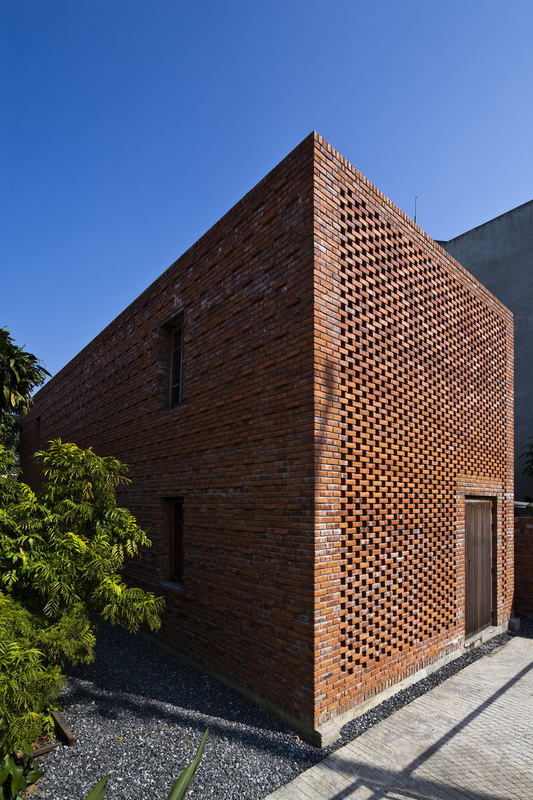 Using bricks and keeping the old garden can make the owner feel familiar with this new house. 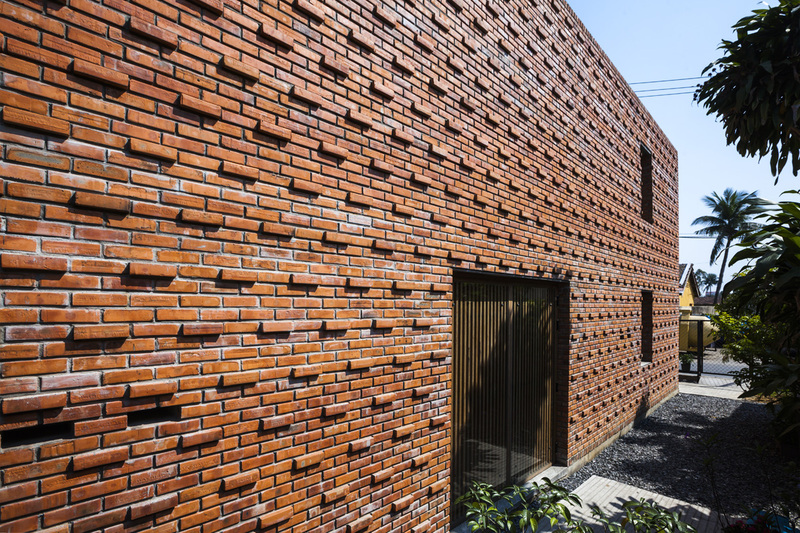 The brick is a local popular material which is subtainable and available with cheap price. 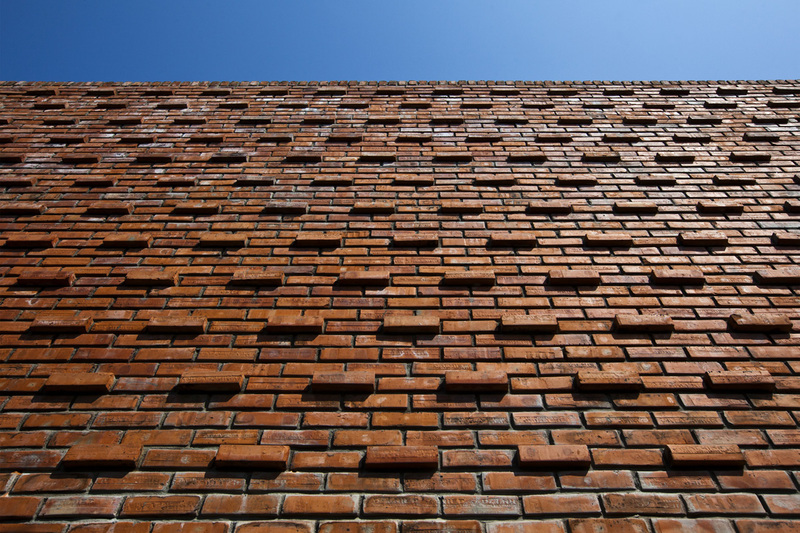 The brick have the absortive capacity which helps to regulate the humidity of the house. This is really important factor to build the house in the tropical climate countries. 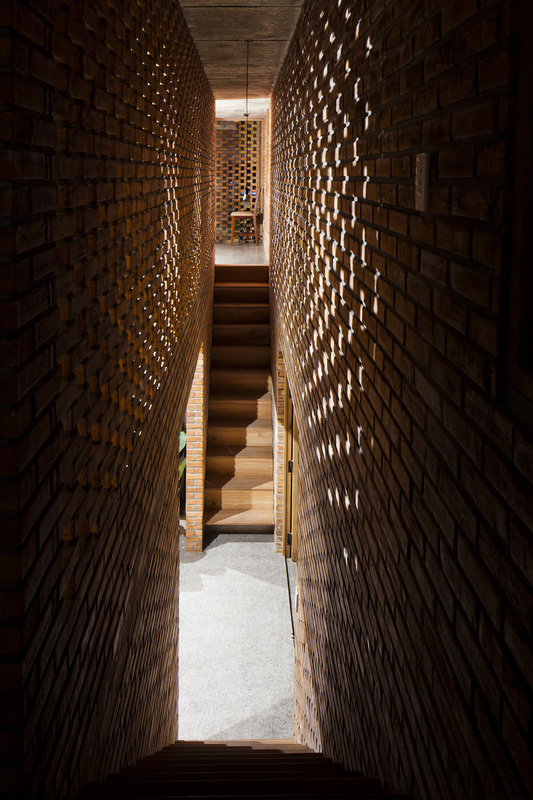 For many years, the brick and other raw material was always hidden under a lot of finish layers, choosing to use brick for the house, the team also want to prove the natural and rustic beauty of the brick under the sunlight which could be an endless inspiration for the architects. 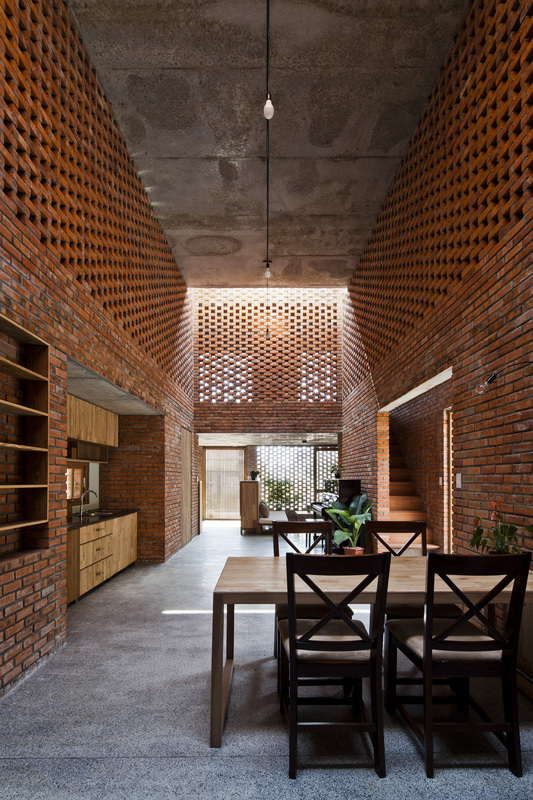 The idea is that if every house is designed like a termitary which can naturally-ventilate and get the sunlight itself, it will create a city area with full of wind and sunlight going through every single area and streets. 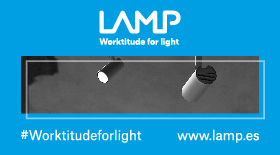 As the result, it can help to save the energy and contribute to decrease the negative impact to global warming. The design team wants to bring a different perspective to the process of organizing living space in the present and the future . 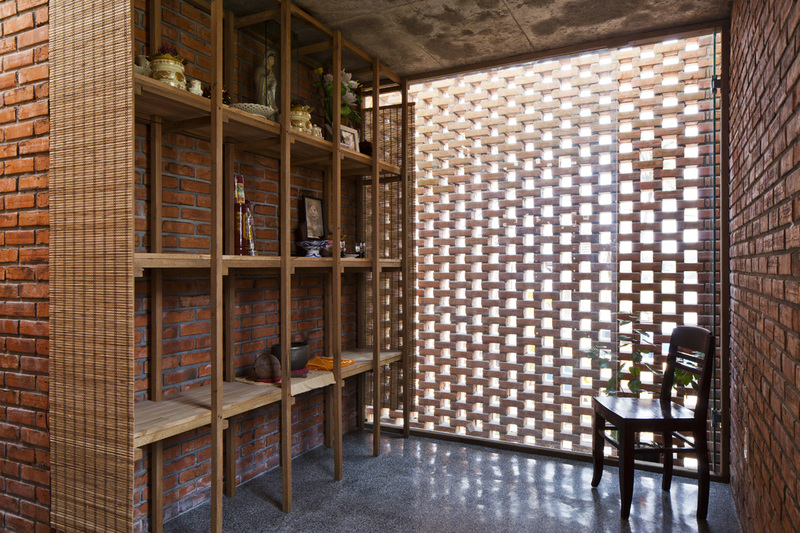 The Termitary House can truly “self-breathing” due to self-ventilation and natural lighting. 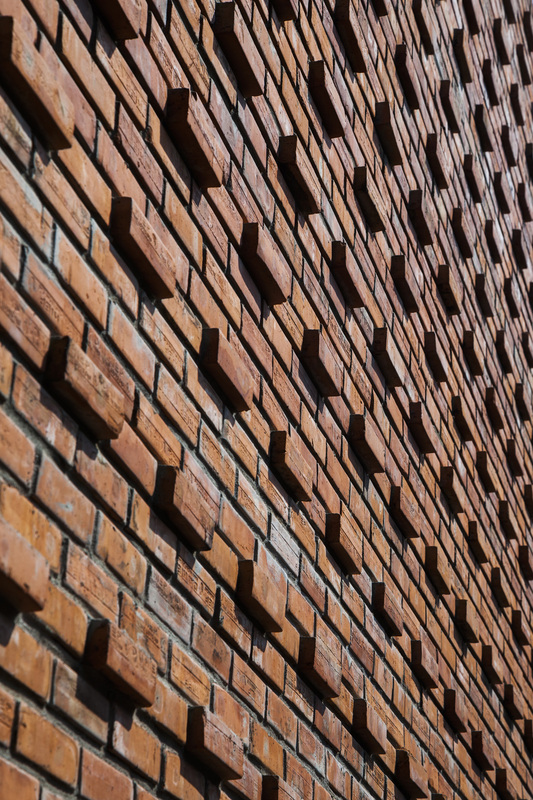 And most importantly, the cost of construction is maximum saving. This model can be applied to build houses for families in the suburban areas and who have average income in tropical climate countries. 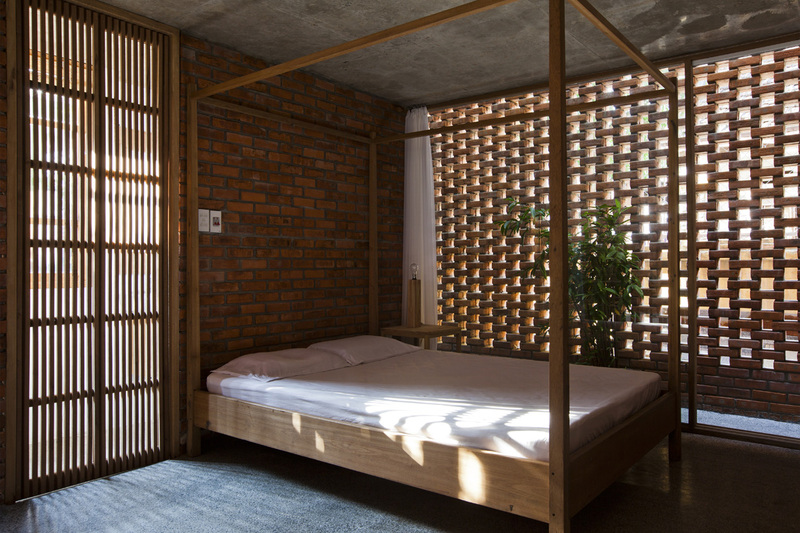 The team think that a ideal house for tropical climate is a house can breath itself. 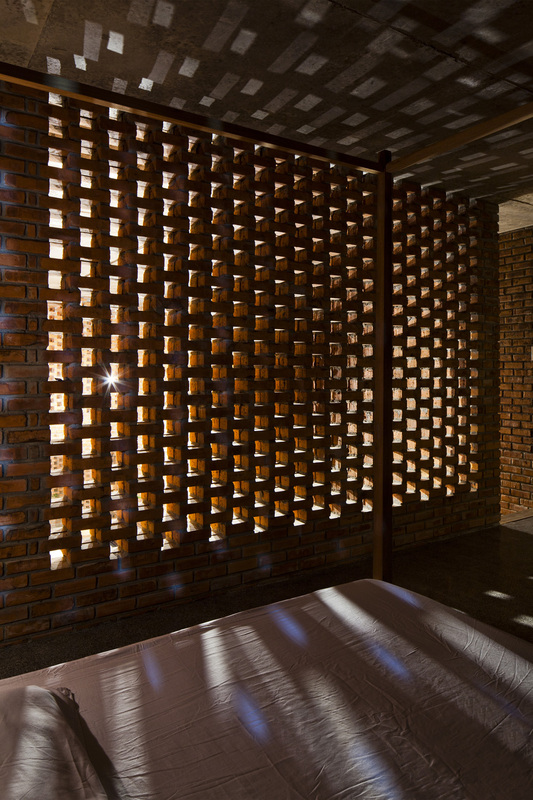 Currently, the company is applying this model for other buildings such as houses, spa, hotel and clinic. 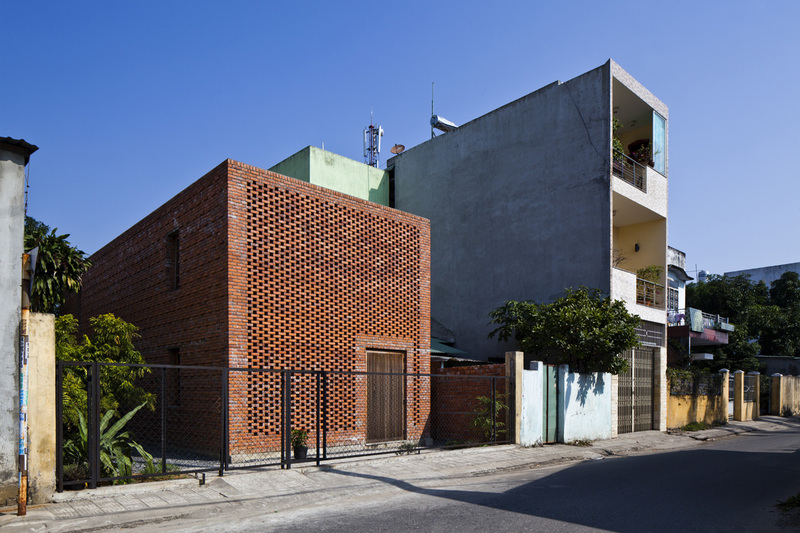 275/8 Truong Chinh Street, An Khe Ward, Thanh Khe District, Da Nang City, Vietnam.